Common rail engines installed in these pickups must use the same mounts as the 12 and 24 valve engines do. This being the case the ECM must be relocated so the mount can be installed in the front group of mounting holes, or the mount may be used in the back group of the mount holes on the block if provisions for the mount are made on the truck's frame. '67-'79 trucks should not be too much of an issue since the mount rests on the top of the frame rail anyway. The '80-'97 trucks, however will need some sort of a perch welded to the cross member to accomplish this. Engine mounts for 99 - 07 trucks are designed to completely replace the Dodge Cummins engine mounts. 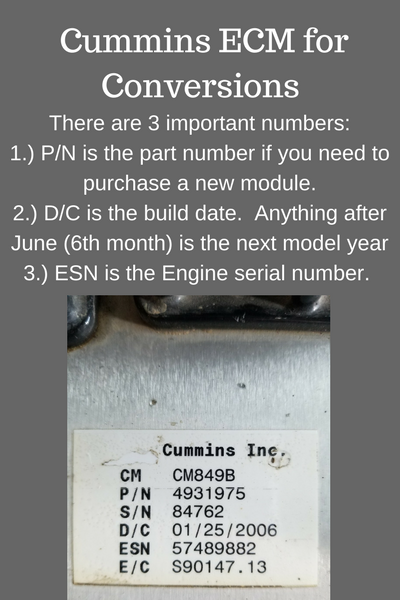 This allows for the Cummins ECM to remain in it's factory location. The mounts also allow you to choose whether you would like to use the Vistronic clutch and manual fan or you may choose electric fans. Both mounting positions are possible with the same set of mounts. We build mounts designed just for the '08-'10 trucks that completely replace the Dodge Cummins mounts. This was necessary to avoid excessive overhang off the back of the driver side cross member. The mounts allow the ECM to be mounted in the stock location. 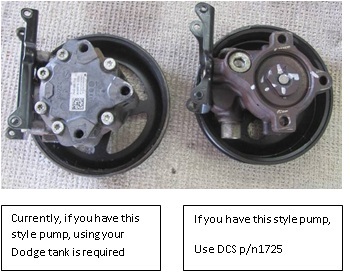 We make an adapter to connect the 1999-2007 Super Duty Ford power steering suction hose to the Dodge Cummins power steering pump if it is like the pump shown in the left picture. This allows you to use the Ford power steering reservoir and keep all the return hose plumbing intact. This adapter is also helpful when installing a Common Rail into a 1967-1997 Ford, but you will have to source a remote power steering tank yourself. Our wire harness modification services for Common rail engines start out with a basic charge (p/n 1922S). We take your Ford engine harness and modify it to either plug into the Cummins engine harness (03-04 years only), or we connect it to the Cummins engine harness (05-current). Consequently, we do not need you to send us your 03-04 Cummins engine harness, but we do need your 05 and newer. We do not provide instructions for wiring for the Common rail Cummins engine. When you receive your modified wire harness it will be plug and play. For 03-04 Cummins we have two other charges that may apply to your harness build. 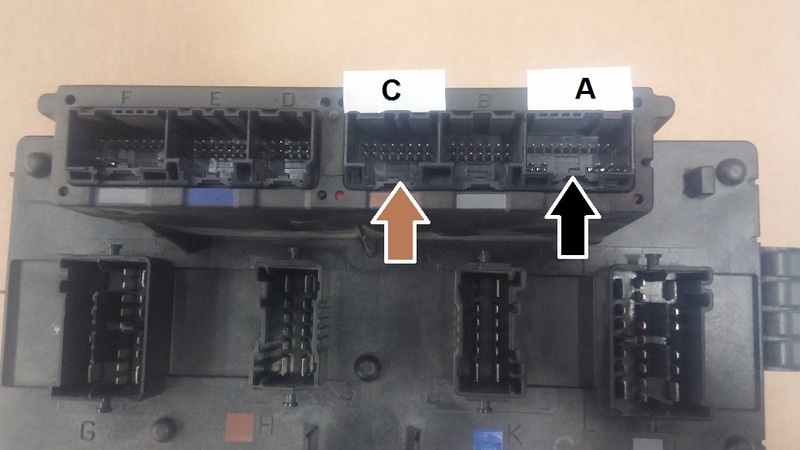 If you are using the Dodge vistronic fan, we have to add this connector into your modified harness, since it is not in the engine harness. The fee for this option (p/n 1924S). This covers the cost of the connector and our labor to wire it into the modified harness. This connector is in 04.5 and newer engine harnesses, so this fee does not apply to engines of that year or newer. In addition to this, all 03-04 Cummins engines that had a manual transmission in the Dodge pickup had a different throttle position sensor, mounted under the battery tray. This connector is not in the engine harness, so it will need to be added into your harness build. This is option (p/n 1925S). This covers the cost of the connector and our labor to wire it into the modified harness. It is possible to need both of these options if you are using the Cummins fan and you have a manual transmission style engine. For 05 and newer Cummins the following other charges may apply. If you are going to use a 03-04 ECM and do not want to change the rocker box we can swap the 05 and newer injector harness connectors into an 03-04 harness. This service (p/n 1926S) PLEASE NOTE: Both Cummins harnesses need to be supplied. If you are using a 06 - 09 Cummins and want to use the factory SKIM module, we can add the wiring for this module (p/n 1919S). Finally if you are using an 06-current Cummins, it is absolutely necessary for us to add in wiring for the Dodge totally integrated power module (the fuse box under the hood). This module has CAN bus functions that are needed for diagnostics or for aftermarket tuners. This is service (p/n 1927S). Please be aware that none of these services include the actual wiring harness needed or modules, it is only the service of making the wiring suitable for use in your Ford. The 05 and newer Cummins has the Dodge vistronic fan connector already in the engine harness, so the 1924S service does not apply. However, even though there is only one style of throttle position sensor used with these engines, the 1925S service normally applies since the harness you send generally does not include the Dodge fly-by-wire pedal wire connector. You have three choices on fans: Aftermarket electric, non-electronic-engine driven, or the stock Dodge vistronic. It can be best to wait on deciding on what option you will use until you get the engine in the truck and see what you will end up doing with your drive shafts. We do not recommend this option in most cases. If you live in a cooler climate or don't work your truck too hard, you may be able to get by with electric fans. Do not buy fan kits designed to replace the factory engine driven fan in stock configurations- as they are too thick to be any help to you in avoiding the transmission move back. We have heard back from many guys that used large or even 2 twin fan kits that have had cooling issues. This is because the fan cfm is not rated behind all the coolers and radiator. Electric fan manufacturers do not recommend their fans for trucks over a certain GVW. You can use a Ford 5.4 clutch with a 99 Power Stroke, or a V-10 (smaller than the P.S.) blade on it. These blades will bolt right on. We are not sure about the durability of this combination, but it is an option. Both of these blades are smaller than the 6.0 blade so they are not as good for trucks that need superior cooling, such as a work truck or trailer puller. On 6.0 trucks use the existing radiator shroud, but throw away the engine side of the shroud on the 6.0. The biggest drawback to this option is that cutting your rear drive shaft and placing the engine in the rear most position with our mounts is a must. This is because the 5.4 fan clutch is longer than the Dodge vistronic clutch. The V-10 blades will fit in your 99-02 shroud, but they may be a bit too small for high ambient temperatures or heavy towing. The Power Stroke fans are too big to fit in your existing fan shroud on 99-02 trucks so you will also need to trim the blades or get a 6.0 Ford radiator (03-07), shroud, upper brackets, and fill/expansion tank. The expansion tank must mount on the driver’s side firewall where it does in the 6.0 trucks. Two pieces of flat bar bolted to the top edge where the wire loom runs work for mounting. The hose must go from the expansion tank down to the lower radiator hose or equivalent. Do not plumb this hose into the driver’s side of the block or the top of the head. You will only need one of the 3/8” hoses from the top of the radiator to the top section of the tank. This is the original equipment, engine driven radiator fan on the ’03 and newer Cummins engines is a combination viscous/electric clutch fan. One advantage to using this option is that when you can place the engine in the middle position (not possible in every truck) you can use the Dodge vistronic clutch, even when you can’t get others in, as it is very space efficient on the Cummins with the 6.0 blade. When using this fan in a conversion, you will need the Cummins vistronic wire connector option in your harness build. For 1999-2007 trucks, reuse or acquire a 6.0L fan blade. This blade is slightly smaller than the Dodge blade and will fit in a Ford 6.0l fan shroud. You can discard the part of the shroud that bolts onto the engine, unless you want to make brackets for it to be mounted to the Cummins engine. The 6.0l blade will bolt right on the Dodge fan clutch. If you don’t have the Ford blade, you can trim the Dodge blade using a set of dividers to mark the blade and cut it with an abrasive cut off wheel. For 2008-2010 use the Cummins fan blades because they move a little more air than the Ford fan blades. Also the 6.4 diesel fan blades turn the opposite direction when compared to the Cummins fan blades. The common rail exhaust manifold is already conversion friendly. If you do not have one, DCS offers a high flow option. If you have a VGT turbo, you will need to purchase an aftermarket controller to retain VGT functions. Other options would be to install a 2003-2006 non VGT common rail turbo or an aftermarket turbo. DCS also offers a few options for down pipes or often times, a portion of the stock common rail downpipe can be used. The Cummins common rail engines are a great choice for your conversion. They offer great power and reliability. Engine tuning upgrades can be done electronically with several tuning service businesses existing in the US and Canada. Full engine diagnostic capabilities are also retained. There are differences in the various model years you’ll want to be aware of before sourcing an engine. Below are some conversion related notes for your consideration. If you are unsure if your ECM is from an automatic or manual transmission truck we can verify this if you provide us with the ESN listed on the ECM. Original APPS (accelerator pedal position sensor) mounted under battery. ECM is compatible with DCS’s harness modification service and pedal module. Key recognition security system was optional on some models which may require a re-flash of the ECM. Original APPS (accelerator pedal position sensor) mounted on engine. This is retained. ECM is compatible with DCS’s harness modification service. Both the Automatic and Manual trans are compatible, however the Manual trans ECM has been reported to be more desirable for power & tuning. Dodge TIPM (Totally Integrated Power Module) required for OBD port communication (On Board Diagnostics). ECM re-flash necessary to eliminate SKIM (Sentry Key Immobilizer Module) security function.